Welp, baby #2 is on the way! Little Emmy is beyond ecstatic to be a big sister (read: she has no idea how much her world is about to change) and Jay is convinced we are bound to have nothing but girls! All the while, I am over here trying to prepare myself for the months ahead. The morning sickness has been making itself very present (all day, every day) since about 6 weeks and my body is already starting to ache! As soon as the test came back with two pink lines, I began gathering my pregnancy must -haves. Here’s what I will e depending on over the next couple months to make this wonderful experiences even more wonderful! As soon as the test came back positive, this was the first thing that went through my mind! I need to start taking vitamins! Luckily, I had about 10 days of supply left over from Emmy and was able to order more on Amazon. 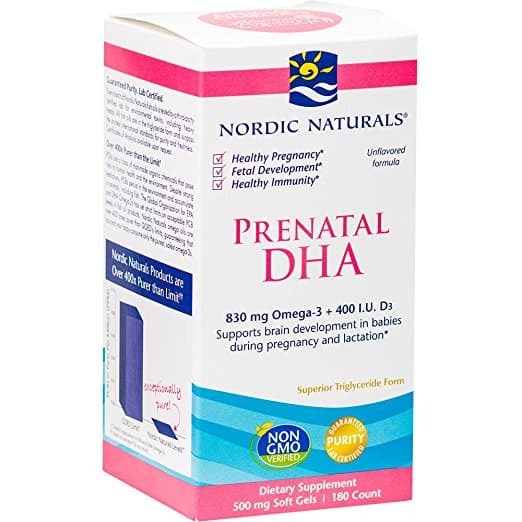 Of course, there are dozens of brands of prenatal vitamins that will do the trick, but always make sure they have DHA! This brand has been my go-to now for both pregnancies. I like that they are soft gels and easy to swallow. Find them here. The morning sickness may only last for a few months, but it makes its presence very strong in that short time. I did an entire post on all my favorite snacks and home remedies used to fight morning sickness with Emmy. While I continued using these methods for baby #2 (including the Pink Stork Morning Sickness Tea) I added in a few new Pink Stork products as well. My new favorite: the aromatherapy necklace. It’s basically a diffuser you are able to wear around your neck! Pink Stork has an awesome essential oil just for morning sickness and it works wonders! I never wore my necklace at night, but I would use the same essential oils in my bedside diffuser to help with the 4 A.M. nausea that seemed to happen every. single. night! A few other products I used daily were the Prenatal Probiotic (for general gut health), Cocolaurin and the Away Bars. 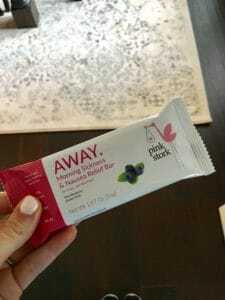 The Away Bars were basically protein bars for pregnant woman! They don’t contain any drugs or unnatural foods that you might find in other protein bars. I was a little worried that they were blueberry flavor (didn’t sound good to my pregnant appetite), but it was surprisingly mild and tasted a lot like a blueberry muffin! The Pink Stork Aromatherapy Necklace. I placed a few drops of their essential oils onto the lava rock inside the necklace and the small lasts all day! To my dismay, my hip and sciatic nerve pain returned WAY earlier than I had first encountered when pregnant with Emmy. Isn’t it funny how one of the biggest symptoms your feel in your first trimester is exhaustion, yet you cannot sleep to save you life?! I tossed and turned all night in my first trimester attempting to get comfortable and ease the pain in my back. The pain almost completely disappeared when I started using the Snoogle. I actually learned about this product before I was pregnant through Facebook. A friend posted how it was the only relief she could find in her third trimester. With Emmy, I had used one of those straight body pillow and with the little relief it had provided, I had written off pregnancy pillows all together thinking they didn’t work. Wrong. This one seriously works! Plus I love how many different ways I can use it. I’m currently using it with the long part across my stomach. Once I hit the point that I can no longer sleep on my back, I plan on flipping it to keep me from rolling over in the middle of the night. As baby gets bigger, the bump gets heavier. Around 6 months, I started wearing a maternity support band with Emmy. It really relieved a lot of pressure from my back. I bought one that sat below the belly (like this one) and it was not visible under my clothes. I have also seen them at Babies R’ Us as well! Make sure it is adjustable in size so you can continue to wear it as you grow and BREATHABLE! When you add your maternity pant waist and a shirt ON TOP of the band, it can get very hot quickly if it is not a breathable material. Ahhh, the tiger stripe scars that come with pregnancy. They are your warrior stripes that show you have done a task only a woman can do and created life. But it’s still nice to try to combat them from taking over! 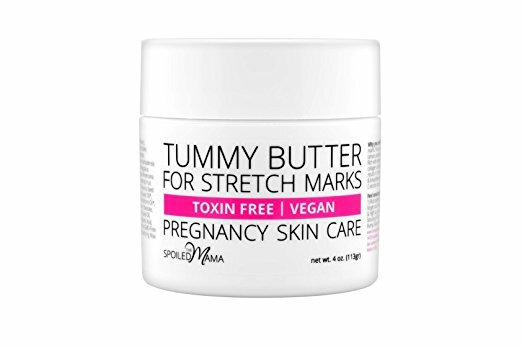 This pregnancy I am giving Tummy Butter a try! I like the fact that the products are 100% natural. Did you know it only takes 26 seconds for toxins to make their way into your blood stream? That fact was enough to make me decide I wanted to play it save and go the natural path. You can find it here. *30 week pregnancy update: while this product ended up working great, I decided to start making my own stretch mark cream! Get the recipe here. If you aren’t a water drinker, you better get used to having to down allllot of h2o everyday. It’s a great way to fight stretch marks and also essential to healthy breast milk production once baby is here. With this pregnancy, I found that anything other than ice cold water didn’t sit well. It would usually make me pretty nauseous. So I ordered an Artic cup and special straws for it. It seriously keeps my water cold for like 12 hours straight. I keep it on my night stand and it is so nice and refreshing in the middle of the night. I aim to drink about 5 full cups a day. Some days it happens and some days is doesn’t, but I can definitely say I am drinking more than I used to! These are not just a pregnancy must have, they are a mom life must have. I own more pairs of leggings than I ever have before! While I’ve got a bump, I practically live in my Blanqui Maternity Leggings. Motherhood Maternity also makes a great pair and they are a fraction of the price of the Blanqui brand! Maternity leggings are also great for after baby comes and you are breastfeeding. They hide your belly well in the case that you have to lift up your shirt when it comes time to feed!